Home/Buying Guides/Here's a quick primer on THE GRILL. It's a grillapalooza out there! Everything from your basic charcoal hibachi to fabulously outfitted gas grills are available these days and they can cost a few dollars to a few thousand dollars. How can you know what option is best for you, your budget and your needs? Here's a quick primer on THE GRILL. Let's start with the one we all know (and some of us love) – the charcoal grill. The charcoal grill can be anything from a shallow pan to a deep bottomed kettle, but the one thing they all have in common is the fuel. Charcoal grills use…yep…charcoal briquettes. Some can also use wood chips and/or a combo of the two. The beauty of a charcoal grill? Your food will have that smoky, cooked outdoorsy taste that makes you want to grill to begin with. The downside of a charcoal grill? They can be messy and frequently need to be cleared of debris and ashes. A charcoal grill requires a little patience while the coals are brought up to proper temperature and the temp on a charcoal grill is not as easy to regulate. However, higher end models come equipped with dampers and vents that help to control the temp. There is also that little matter of lighting the charcoal. The fire bugs among us love that fiery rush we get from the combination of lighter fuel and kitchen matches. The more cautious can use electric igniters or handy charcoal chimney starters. Charcoal grills tend to be less expensive than other grills, although you can still shell out some dollars on higher end models. The Bison Charcoal grill by Fire Magic offers even heat distribution and temperature control with air control vents, manual charcoal elevation adjustment and a double walled hood. 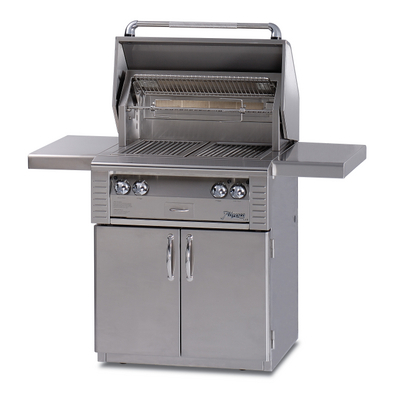 The Bison comes with a 12" firebox that allows you to use the grill for convection cooking. The Legacy Charcoal grill, also by Fire Magic offers stainless steel construction and comes equipped with air shutters and an adjustable charcoal pan to control the heat and the smoke. It also has a hood that allows you to use the grill as a smoker. The convenience factor of gas grills is undeniable. Whether liquid propane or natural, there are several advantages to using gas; it is a clean, efficient and quick way to cook up an outdoor feast. Gas burns more cleanly than charcoal and doesn't leave a pile of greasy ashes to clean up. Not only do gas grills ignite quickly and easily, they are ready to use in a very few minutes. While charcoal grills need to be replenished with each round of cooking; a standard size propane tank of gas will be good for nearly 10 hours of grilling time. If your home has a gas line, you can connect your gas grill and have a constant supply of fuel. There are two small issues with gas grilling; you will need to be sure to use a drip pan to avoid flare ups. The other issue is that cooking with gas doesn't give your food a smoky, char-grilled flavor. However there are ways to accomplish this; one is the use of a smoker box. You add wood chips to the box, put it on the grill along with your meat and close the lid; voila! Smoky flavor. 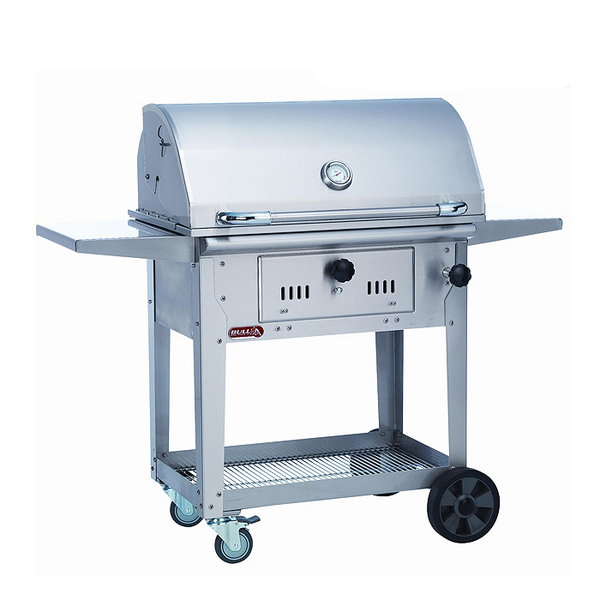 Some gas grills have been designed to cook with both gas and briquettes at the same time. Titan Grills has the Three Burner Grill Head; this grill is a bargain and offers a briquette system with both direct and indirect heat which gives you better heat distribution and less cooking time and, most importantly, better tasting food. It is constructed of commercial grade stainless steel. The Saber SS 670 Infrared Grill by Saber is a gas grill with a twist; it utilizes infrared heat that delivers complete accuracy of temperature. 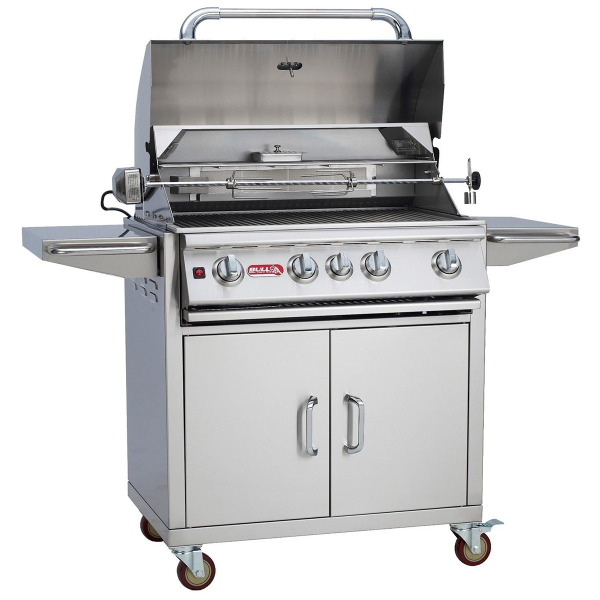 This grill has a huge 895 square inches of cooking area and has a total of 50.000 BTUs. There are four individual burner zones, a warming rack and built-in halogen lights for night-time cooking. The Saber SS-670 goes from zero to 700 degrees in ten minutes flat. The Angus Grill by Bull Grills is an option laden beauty for someone who is really serious about cooking outdoors. 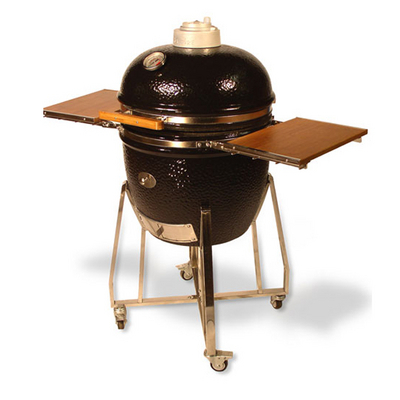 Equipped with 4 main classic burners, the Angus also offers a warming rack, a power rotisserie, there are deflectors that protect the burners from grease and moisture, a lighting system for grilling after dark, and push to light piezo igniters. It is commercial grade stainless steel, through and through. You don't need a smoker; just like you don't need 50 sports channels on your television. You get a smoker because you want one. Truth is, you can “smoke" on a charcoal or gas grill with a few tricks or accessories…but it's not quite the same. When you roam into the world of the smoker, you are really and truly in barbeque land. Smokers are constructed to cook at low temps for long periods of time, during which they perform a feat of alchemy, turning the muscles and sinews of any meat into succulent, sweet, melt in your mouth magic. There are many styles of smokers, but two are particularly distinctive. One is the oval-shaped ceramic grill that is a modern translation of a classic Asian style cooker. The Saffire Grill Smoker offers over 18 hours of low temp cooking utilizing a single load of charcoal! Although built to cook up brisket that would put Kansas City to shame; the Saffire Grill Smoker you can also grill up some fine steaks or even bake a pizza. Another common style of smoker is the vertical style smoker like this Fornetto-Alto Oven and Smoker. This smoker is stainless steel with enameled cast iron doors and can be heated with either charcoal briquettes or wood. The Fornetto functions as a smoker and convection oven. Now for something completely different; the infrared grill. Infrared heat, aka radiant heat transfers energy directly to your food without losing any of it to the atmosphere; it is focused and intense, allowing you to achieve a perfect sear on a steak at staggering temps of nearly 900 degrees. Infrared grills tend to use less energy than traditional grills; they heat up more quickly and the heat is even. The ALX2-301RC Infrared Grill is an example of an all-infrared grill which has two main burners as well as a rotisserie back burner and a wood chunk burner. Can't make up your mind? Many of the grills offered today will serve up a combination of features; you can find gas/charcoal hybrids; gas grills with infrared burners; smokers that serve as pizza ovens; charcoal grills that come with hoods that convert them to smokers, and on and on. Check out all the grills offered at FamilyLeisure.com and find the brill or combination grill that suits your needs.